Regent Seven Seas Cruises - Just Cruises Inc.
Unsurpassed levels of luxury define the Regent Experience: gracious and attentive service with a smile, you're every desire and wildest dreams fulfilled, your spirit relaxed amidst tranquil seas and absolutely magnificent scenery. 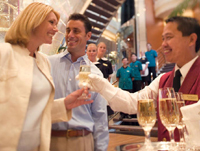 Personalized itineraries allow guests to customize a voyage that is truly their own. Programs such as the Spotlight Series & the outstanding land programs ensure that each adventure ashore is an unforgettably authentic event, offering intimate encounters at each port of call. Private Arrangements can even schedule you with expert guides in a unique, one-on-one expedition. They enlighten each exclusive tour with insights into the hidden treasures and gems of each area. Their uncommon destinations offer veteran travelers the exotic allure they find so intriguing. They avoid mass-market tourist meccas and take the extra step towards less-traveled passages and unspoiled frontiers. From frozen Alaskan fjords to volcanic peaks of Polynesia, from the glacial tundra of Antarctica to the sun-drenched Central American rainforests, you will chart a course through the most exotic locales on earth. Whichever path you choose to follow. Regent's uncompromising excellence will replenish your body and spirit. Relish in the diversity of fine dining at one of the restaurants or in taking an exciting land excursion on an island paradise. There are so many rich experiences to be had just steps beyond your luxurious accommodations. a superb staff-to-guest ratio means you will receive unparalleled service and attention as you explore the world's most exhilarating locations.